Appropriate architecture (design) applies to both buildings and boats, as well as all the other manufactured items we use every day. Appropriate materials, aesthetics, how something fits in terms of surrounding environment, use, and historic context are all central to appropriate design. My first lessons in architecture came from my Grandfather, Harry Roberts, when I was about 10 years old. Harry had designed and built a number of houses by this time in his life, first at Robert’s Creek, then at Merry Island, and finally at Cape Cockburn on Nelson Island. His ideas on architecture changed radically along the way. 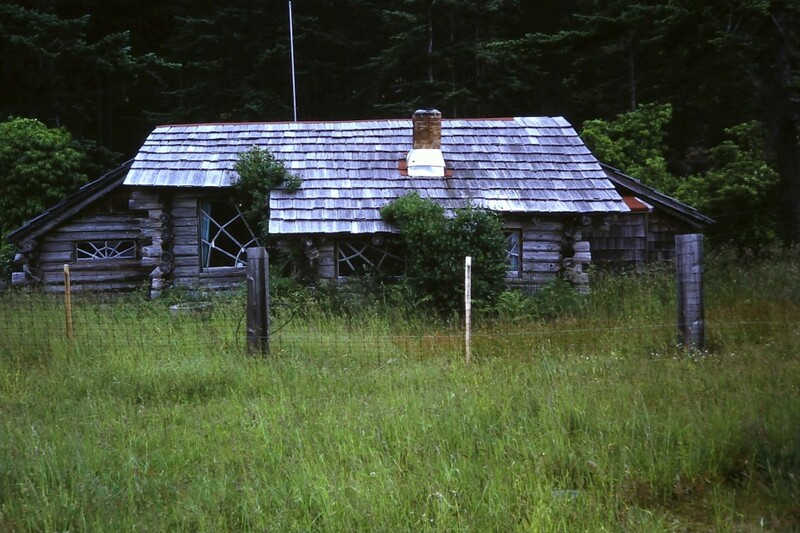 His first house was of logs, rectangular with a single level main floor, a single peaked roof, and was built on flat ground at Roberts Creek in 1905. He was young, newly married, and in a hurry. Ten years later he started a second far more elaborate waterfront log home which was to become known as the “Castle”, completed in 1917 and still a landmark at the creek mouth. The castle is two stories though Harry was a short Welshman so headroom upstairs is minimal. But the building at least considered it’s environment, few small windows on the north side which is well sheltered by big fir trees, lot’s of south facing glass, a greenhouse on the southwest corner, and rooms grouped around the “central” heating (fireplaces and wood cook stove in the kitchen). Harry’s fifth house is named Sunray, finished in 1932 and is by far the best conceived. Again of cedar logs with cement floors made of the sand and gravel found outside the front door. It’s built in a spiral completing one rotation on multiple levels with the kitchen (wood heat) lowest and master bedroom highest (over the kitchen). This building is nestled out of the wind behind the gravel beach berm on an exposed cape. Burrowed into the hillside, the kitchen is at ground level facing away from the weather and all levels have natural light. Its north side is sheltered by the woodshed and the cement and rock back of the big livingroom fireplace. The kitchen looks out on a large enclosed summer kitchen and work room which in turn looks out on the orchard and garden. James Wharram has a theory that natural materials are the most comfortable and comforting for people needing shelter in a house or boat. One can (At least I can) feel this upon entry into Sunray, the low massively beamed ceilings, glowing oiled wood walls, built in log furniture, and natural rock and sand floors are an integrated design that is at once simple and complete. There is no fake gilding or plastic luxury, the luxury is in real materials properly used. This luxury is beyond stylish and will stand up as good design despite fashion. These houses were my earliest examples of using local materials and letting the design flow from its use and environment. This is the direct opposite of the “dropped from outer space” school of design to which so called “modern” designers seem to ascribe. I feel part of the ill fit we find with modern design is the split between home and work. It used to be that home was where you did much or all of your work. In fact, at the time my Grandfather was building his houses, there was no split, it was all just life. Thus the house was a part of the work one did. In the past 50 years people have left home to go to a place of work, and the house becomes a status symbol (and a place to sleep) that is never under construction or less than perfectly neat as if no one lives there. Today we see more folks returning to work from or at home, which is in my view a healthy trend. Now if we could get past the ideas that boats can only be luxury yachts required for holidays and that families can’t spend days working at home together. So my grandfather’s ideas about appropriate design and materials were passed to me. When I built a farmhouse in Maine it was an adaptation of the traditional style, but included modern insulation and passive solar siteing and it was entirely lined with Maine pine left bright. In thinking about a new house for the BC coast, I look to native long houses or (IMO) their descendents, the net shed. These were large rectangular buildings, of simple form, set with one narrow end toward the water. Again modern architecture seems to push “busy design” as good design. I disagree; simplicity coupled with good proportion can be elegant. The simple form done with appropriate materials (local) fits into and becomes part of the landscape, just as the terracotta and tile houses of Tuscany fit into the ancient hillsides. The net shed or long house is infinitely scalable and thus adaptable to numerous uses. Key would be incorporating home and work under one roof. My layout would have living space on the main (ground level) floor at the waterfront end. Above this would be office space and the back 2/3rds of the building would be boat shop, closed off from living and office areas but with connecting windows and doors. The smaller version of this arrangement would all be on one level. Bringing this subject back to boats I am always struck by the inappropriateness of sleek white plastic boats in our bay. The hard surfaces, spaceship looks, aggressive stance and general inorganic unfriendliness just doesn’t fit. These boats seem at home in the harsh bright sunlight of the Caribbean but in our soft misty light they are alien vessels intended for very different use. Only in the very hottest days of August do they start to make sense with their dark interiors and tiny black tinted slit windows. Wooden boats are imperfect, surfaces have character gained over years of hard use bumping docks and other boats, paint wears away to expose bare wood, grain shows as do fastenings that tell stories. These are stories of the past, but also of the future that can be. These materials and techniques remain timeless, they are not going out of fashion because fashion is not involved. The boats of our coast, built of our materials, do not fit in the Caribbean sun, but they fit here now and for ever. 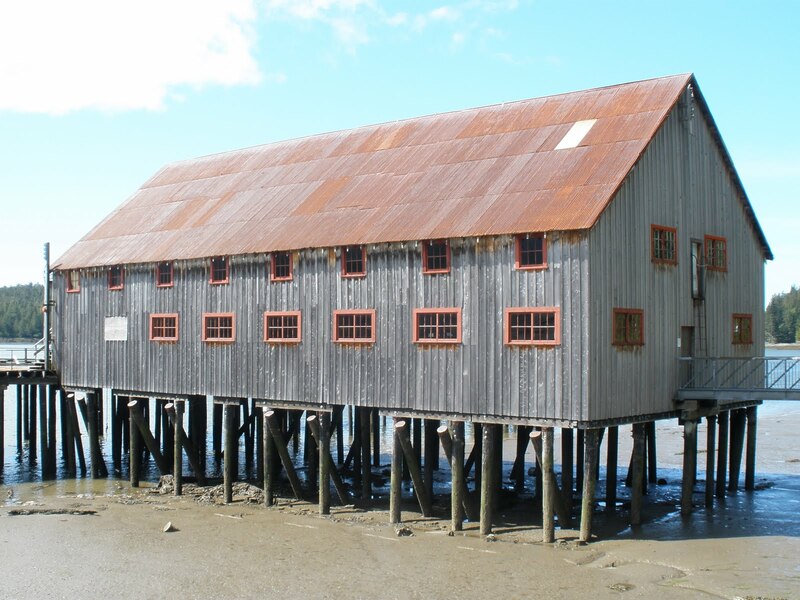 Below is the net shed at the North Pacific Cannery on the Skeena River. Thanks to Carolyn at Living on the Edge for the photo.